An adult deer can easily jump 7 ft. or higher, and can squeeze through small gaps in vertical or horizontal slatted fences. While short fences (4 ft.) may be effective at reducing damage in very small areas or around individual trees or shrubs, a “deer proof” fence would need to be 8 ft. or taller and constructed of strong impenetrable material like welded wire or chain link to be effective long-term. This type of fence is expensive, it is not aesthetically pleasing, and may not be feasible in many situations. However, the one-time cost of erecting a permanent 8 ft. fence may be offset by many years of a damage free area. Although deer can jump high and far, their eyes are located on the side of their head, giving them poor depth perception. A 3-dimensional electric fence will not serve as a “deer proof” fence, but can serve as an effective deer deterrent, and may be a less expensive fencing option. One effective design involves erecting 2 single strand electric fences, each 2ft tall, and 5ft apart. Another effective design involves erecting a multi-strand electric fence angled outward at 45 degrees. These type fences require continued maintenance and may be less effective if deer are already accustomed to coming into the fenced area. if you ignore these issues, you may waste your time and money. Electric deer barriers act on the animal's brain, not its body. Thus the best fence may fail if it is installed at the wrong time on the wrong site and managed without an awareness of how a deer herd interacts with your area and the new fence. The only sure deer barrier is a woven wire fence or brick wall 8-10 ft. tall. All other deer fences involve some risk and require thought in placement and maintenance. Deer are creatures of habit. Where they choose to feed or rub is a habit learned over time and reinforced every time they feed there safely. To exclude a deer herd from a food source forces the herd to break this habit. Thus the first day, week and month of denial is the key period. Once a feeding habit is broken, the change is usually easier to maintain. Deer make "cost-benefit" decisions about preferred feeding sites, trails and rubbing trees. Pain barriers for deer use electric shock to suddenly raise the "cost" (degree of risk and effort to use an area). The goal is to persuade the deer that it is safer and less painful to feed or rub elsewhere. Do not expect success in persuading a starving deer herd to feed elsewhere if your site is its only food source. Pain barriers work best when deer are hesitant. Therefore they are less successful when the animal is being chased or moving down a known trail or path. So identify any deer trails entering the exclusion area and block them with logs or brush pile so the deer is forced to take a different route. Terrified animals do not make normal decisions. Once deer learn that they can leap over or crawl under a fence, they're more likely to do so even when they're not terrified. Don't try to repel deer from the entire area all at once. Remember, the intent is to change the herd's "mind" and thus its behavior. Therefore, install the new fence around a very small area first. Leave it in place and working for 2 weeks. The deer will encounter it, learn to avoid it and begin to regularly feed or rub in areas not enclosed by the new pain barrier. Progressively expand the area enclosed until 100% of the area is protected. Using this technique the first fence should have 2 - 4 strands instead of 1 -2—thus increasing the probability of eventual complete success. Deer interpret a fence in their terms, not ours. Their world is not color—but black, white and shades of gray. Therefore barriers that contrast with their perceived natural world are thus the most visible and most likely to get their attention. Deer use their noses to investigate. They see moving objects more readily than stationary objects. Tying black and white fabric or contrasting mylar strips onto the electric wires helps deer perceive the barrier better. Deer fear that which is strange and new. So, avoid using fence conductors that they already recognize and do not fear. For example, single strand electric fences, barbed wire fences etc. are common in the deer’s world and often deer do not fear these types of fences in their environment. Allow routes for escape. When deer encounter an electric fence, they are less likely to jump over it or crawl under it if they have alternative avenues to avoid the fence. So building the fence 6-8 ft. away from a forest provides deer space to maneuver when they suddenly receive a shock. As a result they detour around an electric fence. Use a powerful fence energizer. Because of their body shape and hollow hair, deer have higher internal resistance to electricity than most animals. Thus, it requires a more powerful energizer (in joules and volts) to produce enough fear to make them avoid an area. Never leave the fence unelectrified especially at night. Not even for an hour. If you want to leave it off during the day, install a timer. However, leave it on continuously for the first month. Bait the energized wires when the fence is first installed and at critical seasons of the year. It is common to wrap peanut butter inside tinfoil and hang it on the fence at 20-40 ft. intervals. The smell draws the deer's nose to fence. The peanut butter fence is effective for small gardens and ornamental plantings (1 acre or less) with moderate deer pressure. Deer are attracted by the peanut butter and encouraged to make nose-to-fence contact. After being shocked, deer learn to avoid fenced areas. To build a peanut butter fence follow the steps below. (1) Install wooden corner posts. (2) String one strand of 17-gauge (0.15-cm), smooth wire around the corners and apply light tension. (3) Set 4-foot (1.2-m) 3/8-inch (1-cm) round fiberglass rods along the wire at 45-foot (14-m) intervals. strips of cloth adhesive tape. (7) Connect the wire to the positive (+) post of a well-grounded fence charger. Check the fence weekly for damage by deer and grounding by vegetation. Several forms of polytape or polywire fencing are very strong and portable. You can use these fences to protect slightly larger acres of vegetable gardens and even some small field crops under moderate deer pressure. Deer receive shocks through nose-to-fence contact and they learn to avoid fenced areas. To build a polytape fence follow the steps below. (1) Drive 5/8-inch (1.6-cm) round fiberglass posts 2 feet (0.6 m) into the ground at the corners. apply light tension (one strand 2 1/2 feet (0.75 m) high can be used). (3) Use square knots or half-hitches to make splices or to secure the polytape to corner posts. above ground level and apply 50 pounds (22.5 kg) of tension. (6) Connect the polytape to the positive (+) post of a well-grounded fence charger. polytape every 6 feet (2 m) where deer presence is expected to be high. You can make a simple applicator by mounting a free-spinning, 4-inch (10-cm) pulley on a shaft inside a plastic ice cream pail. Fill the pail with a peanut butter-vegetable oil mixture that has the consistency of very thick paint. Coat the entire wire with peanut butter by drawing the pulley along the wire. Apply peanut butter once a month. Attach foil flags to the fence near runways or areas of high deer pressure to make the fence more attractive. To maintain the fence, check it weekly for damage by deer and grounding by vegetation. Vertical fences are effective at protecting large areas from moderate to high deer pressures. Because of the prescribed wiring, deer are either effectively shocked attempting to go through the fence or they are physically impeded by the barrier. Vertical fences use less ground space than three-dimensional fences, but are probably less effective at inhibiting deer from jumping over fences. There is a wide variety of fence materials, wire spacing, and specific designs you can use. While you can build this fence yourself, local fencing contractors may also be used. To build a 7-wire vertical deer fence follow the steps below. 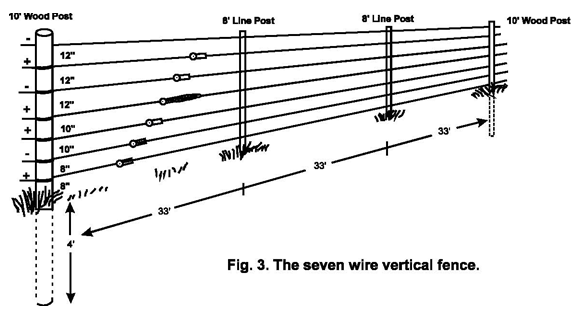 (3) Set 8-foot (2.4-m) line posts along the wire at 33-foot (10-m) intervals. pounds (68 to 113 kg) of tension. apply 150 to 250 pounds (68 to 113 kg) of tension. of a well-grounded, low¬ impedance fence charger. Maintenance includes weekly fence inspection and voltage checks. This fence is mostly for gardens, truck farms, or nurseries up to about 40 acres (0.16 ha) that experience moderate deer pressure. Deer are repelled by the shock and the three-dimensional nature of the fence. You can add wires if deer pressure increases. To build an offset or double fence follows the steps below. assemblies and apply light tension. (3) Set 5-foot (1.5-m) line posts along the wire at 40- to 60-foot (12- to 18- intervals. (1) String a wire around the inside of the swing corner assemblies and apply light tension. (2) Set 5-foot (1.5-m) line posts along the wire at 40- to 60-foot (12- to 18- m) intervals. (3) Attach the wire to insulators on the line posts at 30 inches (76 cm) above ground level. (4) Attach all wires to the positive (+) post of a well-grounded, low impedance fence charger. Maintenance includes weekly fence and voltage checks. This fence is used where high deer pressures threaten moderate-to-large sized orchards, nurseries and other high-value crops. It presents a physical and psychological barrier to deer because of its electric shock and three-dimensional nature. To build a slanted seven-wire deer fence follow the steps below. (3) Set angle braces along the wire at 90-foot (27-m) intervals. (4) Attach a wire at the 10-inch (25- cm) position and apply 150 pounds (68 kg) of tension. (6) Place fence battens at 30-foot (9-m) intervals. (8) Connect the second, fourth, and sixth wires from the top directly to ground. (9) Clear and maintain a 6- to 12-foot (1.8- to 3.6-m) area outside the fence so deer can see it. Maintenance includes weekly inspection and voltage checks. Woven-wire fences are used for year-round protection of high-value crops subject to high deer pressures. These fences are expensive and difficult to construct, but easy to maintain. Before high-tensile electric fencing, woven-wire fences were used most often to protect orchards or nurseries where the high crop value, perennial nature of damage, acreage, and 20-year life span of the fences justified the initial costs. The high cost has resulted in reduced use of woven-wire fences, however, this is the single most effective fencing option there is. Unless you are familiar with fence construction or fencing a very small area (<.5 acres) it is recommended you consult with or hire a fencing contractor to ensure proper installation and that your investment is effective and durable. To build a deer-proof woven-wire fence follows the steps below. (1) Set rigid corner assemblies where necessary. (2) String a light wire between two corners and apply light tension. (3) Set 16-foot posts along the wire at 40-foot intervals, to a depth of 4 to 6 feet. ground level to a corner post with steel staples. to line and corner posts with steel staples. (6) Repeat steps 4 and 5 as necessary around the perimeter of the fence. the entire fence to 9 to 10 feet. Minimal maintenance is required. Inspect for locations where deer can crawl under the fence. 2 strands of wire above the fence might become necessary. Use of fences such as these is often prohibited by local HOAs and similar organizations. In residential areas experiencing extreme deer damage, changes may be needed in covenants and restrictions to allow permanent fencing which effectively excludes deer from yards.